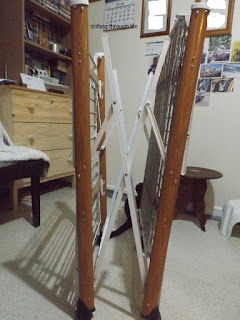 Today I'll introduce you to one of my favourite pieces of equipment, commonly called a clothes airer, I use it for drying things small enough to fit when the weather outside means I can't hang things on the backyard line. Which is most of the time because it's not nice out there where the sun rarely shines longer than an hour before being shadowed by the buildings. here she is, all folded up to fit nicely behind any door. You'll notice she has wheels for convenient moving. See the little round table in the background? We'll get to that later. the top section is lifted from where it hung down inside the side and locked into place, I had to white out some family photos there. as do two sets of side wings. How's that for lots of hanging space? 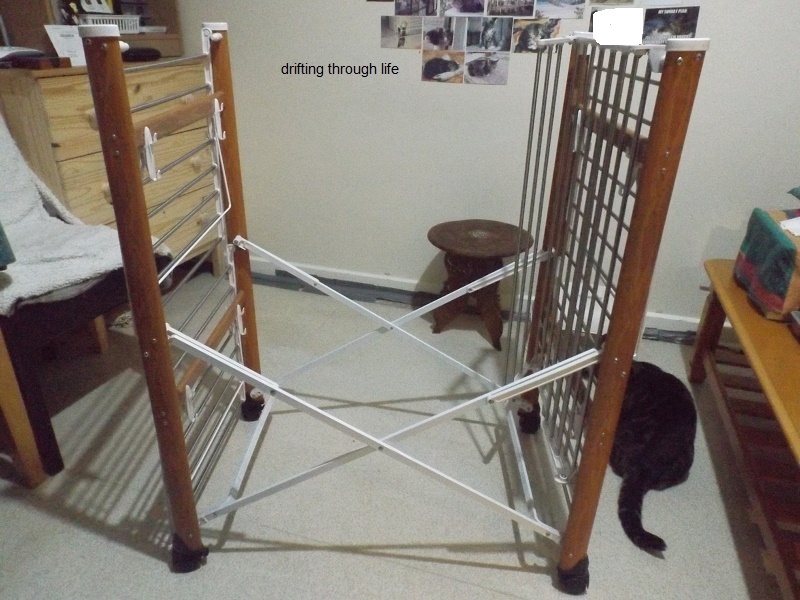 It isn't very wide, I can't hang bedsheets on it, they have to go out on to the sunless washing line. But it takes care of all the small stuff. 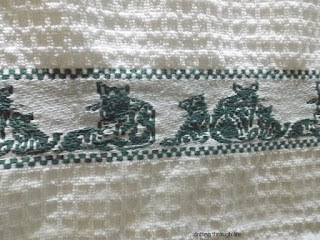 I found this top quality tea towel at a thrift shop for only $4, it is so closely woven it should last forever and I love the kitty border, which looks grey here but is actually a dark green. the border is so colourful too. and here is that little carved wood side table, found in the same thrift shop, I'm so glad I went in there that day. Usually I just put stuff in the collection bin out front. if you look closely at the middle you'll see one of the white diamond shapes is missing, I can fill that in with a bit of white plaster or similar. That table is fantastic! Hick would love it. The blanket and tea towel are great, too. 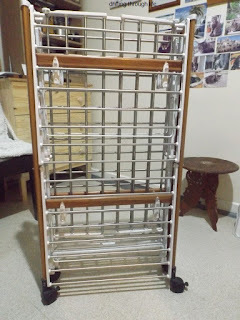 I used to have a wooden drying rack, not nearly that size, not even waist high. It was made of dowel rods, but good for apartment living, when I had things that couldn't be machine dried. 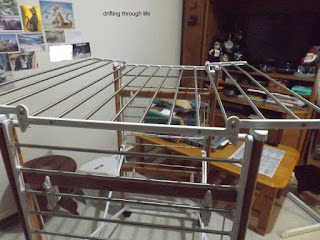 Val; I have several drying racks that open out quite large and they take up most of the back porch space if I'm doing a huge wash day. 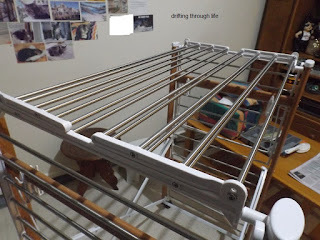 I do have a machine dryer, but with the cost of our electricity, I prefer to just hang things until only the seams are damp, then finish them off in the machine. Of course in summer I don't need the machine at all. 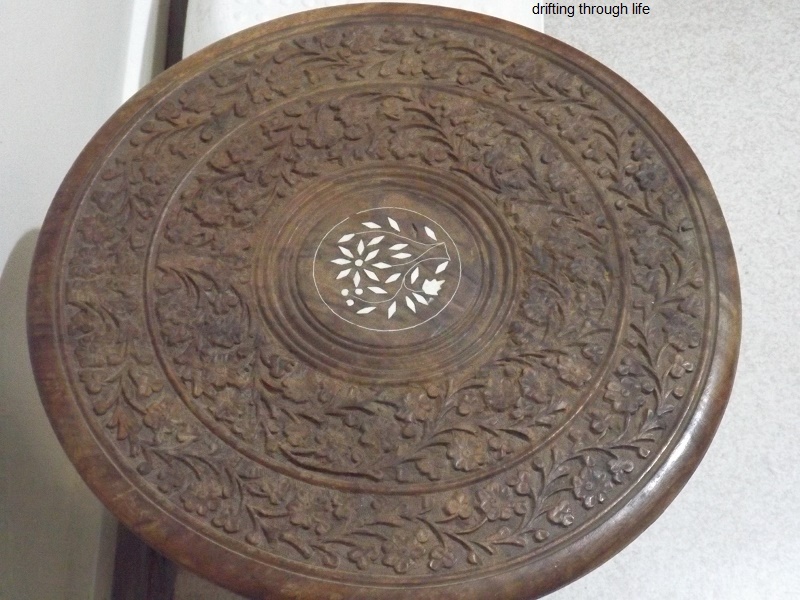 The table is small, 15 inches across and 15 and a half inches high. 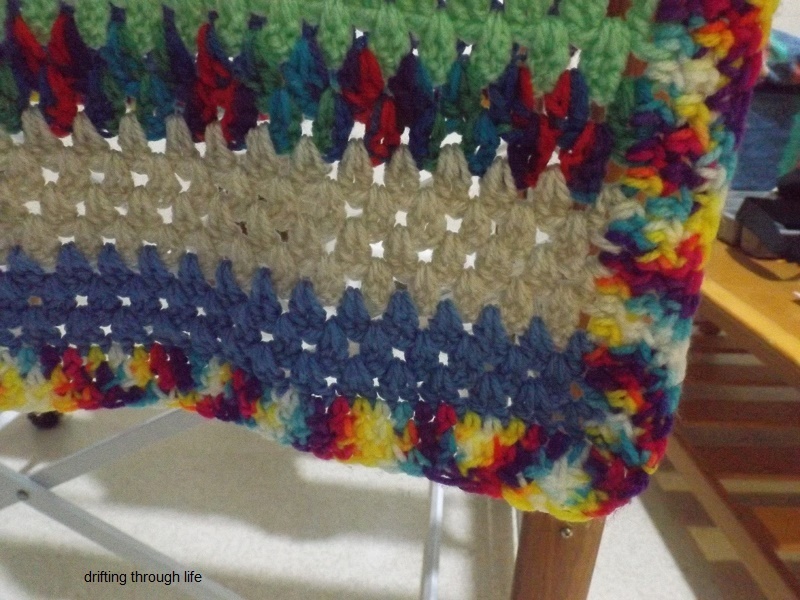 Your drying rack is a real find. I hate, loathe and despise a house filled with wet washing, but sometimes it is essential. Your drying rack puts ours to shame. Love your thrift shop finds too. Elephant's Child; the drying rack is from Cheap as Chips, I've had it for about four years now. I saw more things at the thrift shop but couldn't carry too much once the table was on my granny trolley, so I'll have to go back. 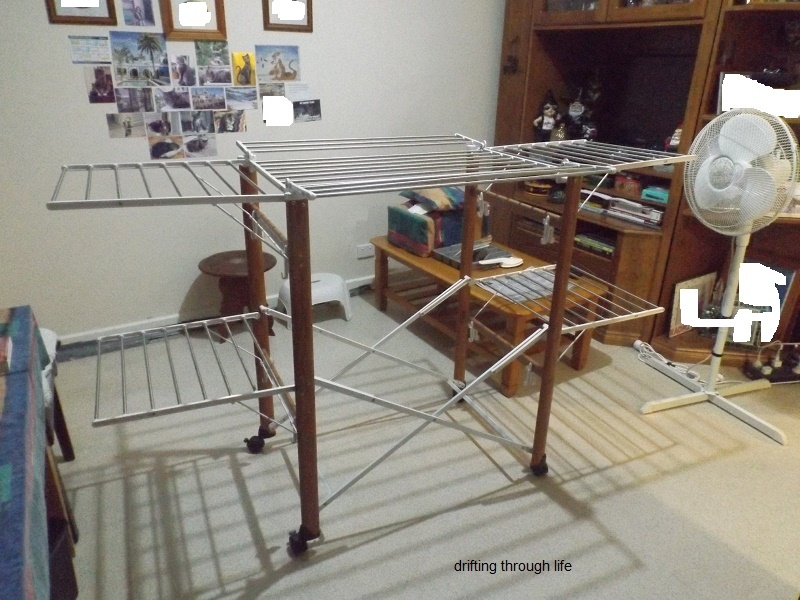 Lee; I find the racks extremely useful, I open one in the lounge room and one in the bedroom while I have the airconditioner on for heating so that helps dry things and I turn the bedroom heater on about an hour before I go to bed, so all the smalls that are hung in there are usually dry by bedtime. Lola has been very cuddly lately. 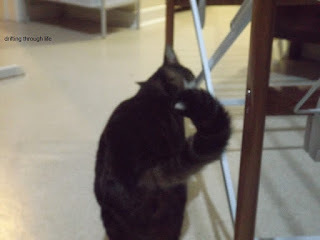 I am quite interested in your clothes airer. I want to type clothes horse. Ours is an old plastic coated rack and the plastic is starting to break up. I can't find another rack the same. There are plenty of smaller ones, but not the large one we have. The new small ones are too light as well. I guess it will have to be one like yours, with fold out ends. About how long is it when fully open? 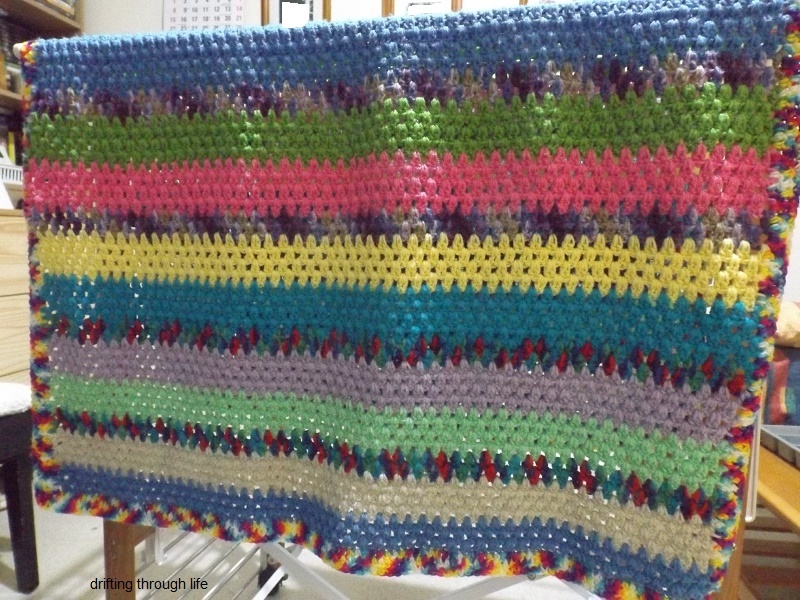 We keep ours in the spare room, folded and behind the door when we have visitors. I am not sure yours would fit behind our door. Andrew; fully open? let me just get the measuring tape...height: 105cm, width 54cm, but side wings are only 49cm with the top wings open that middle section is 79cm, the fully opened length is 173cm. I got it from Cheap as Chips about 4 years ago, had to get a taxi home because I couldn't carry the box on a bus. They have another type which I can take a photo of and post it soonish. Fully closed the one here is 54cm by 13cm, so it should fit behind most doors. I don't like the new plastic coated ones, they are far too flimsy nowadays. That is one really nice drying rack! We have two, both completely different from each other and from yours, and i use them a lot. The tea towel is an especially lovely find. 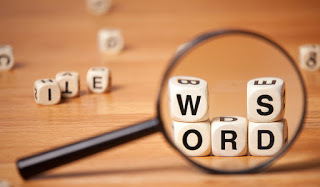 Once my post goes live in a few hours, my Sunday Selections will be here. messymimi; I love that rack, it's the one I use the most although I do have two others which take up most of the back porch when opened. 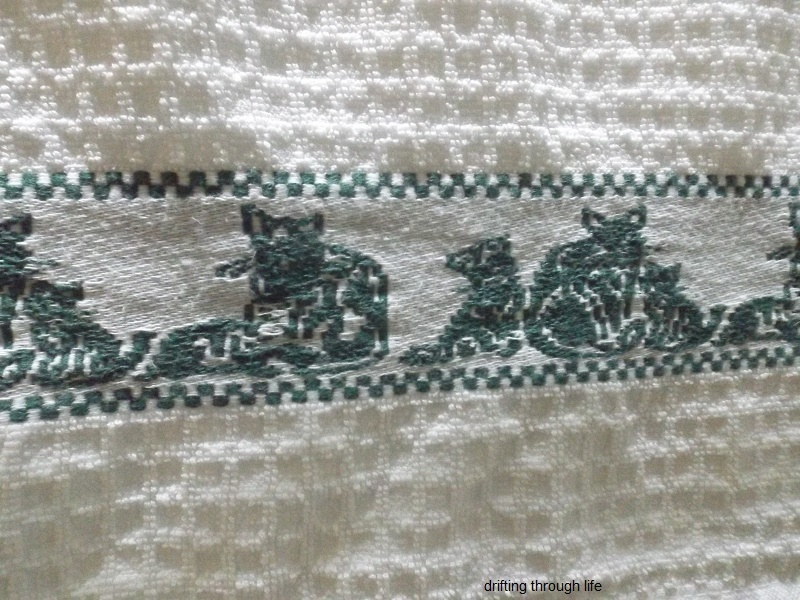 I'm very happy with the teatowel, you don't find such closely woven towels in shops these days. Isn't amazing what one finds in a thrift store. peppylady (Dora) thrift stores are amazing, but it depends on what you are looking for. Sometimes they have nothing I'd want so I don't go for a while then if I pop in just on a whim, I find great stuff. 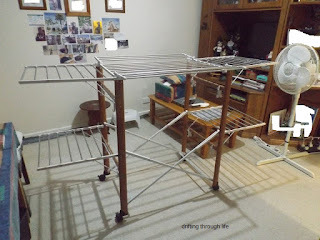 I have never seen a drying rack but can see where they would really be useful. Now you have me wanting to check out some thrift stores. Arkansas Patti; never seen a drying rack? Sometimes they are called clothes airers and people hang things to air after being stored or ironed. Granny Annie; they should be easy enough to find, they're everywhere here. Places like K-mart, Target, BigW and most hardware stores have them as well as the cheap places, like Cheap as Chips and The Reject Shop. I imagine at least one of those places has them in America. 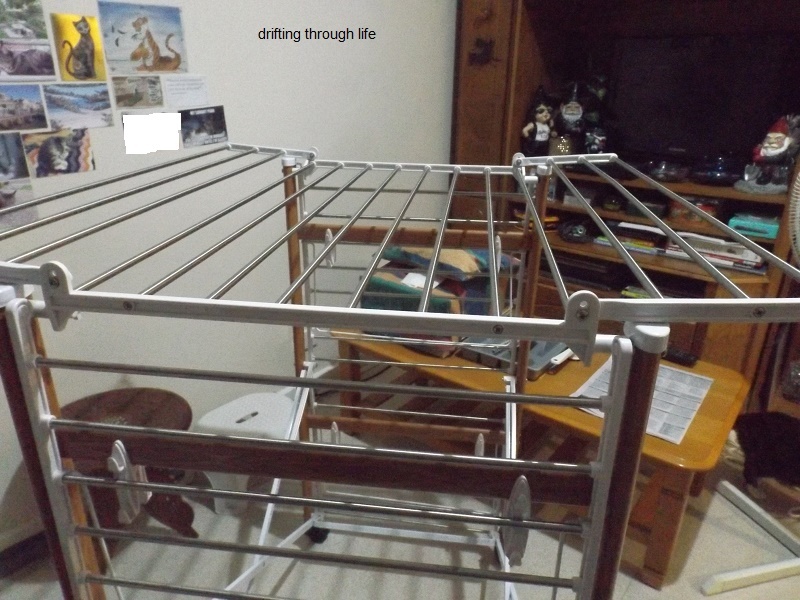 We used to have those clothes dryer racks here in the US when I was young. Haven't seen one in years. All the young people want a stainless steel washer/dryer that costs more than my first automobile! Nice treasures from the thrift store. I haven't scored a treasure in awhile. RP; they're probably still around, just takes a bit of looking, perhaps online, or ask at local hardware stores that also carry homewares. I don't go to thrift stores very often, usually wait a season or two for the stock to change, then go in and find a treasure or two. 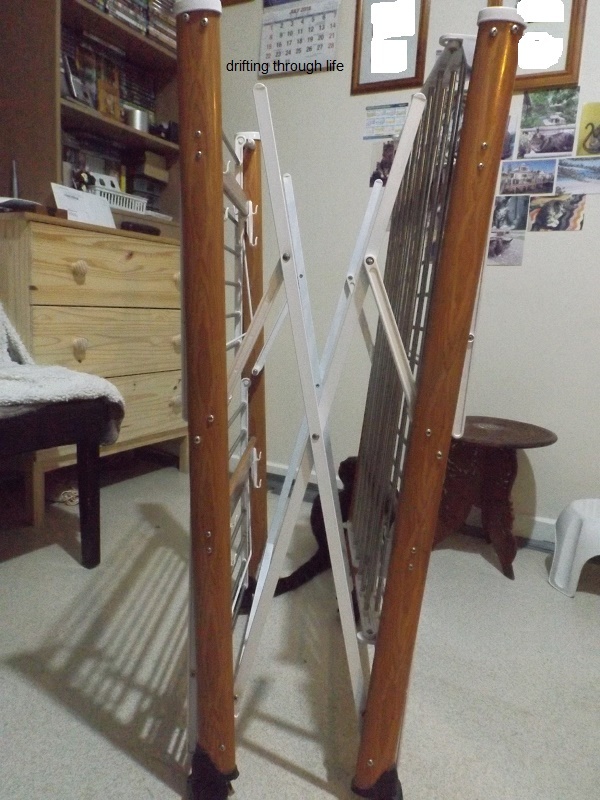 That looks like a handy airer. My clothes usually end up hung on radiators all around the house - not a good look! I used to have a little table just like that. Does the top come off and the legs fold up? 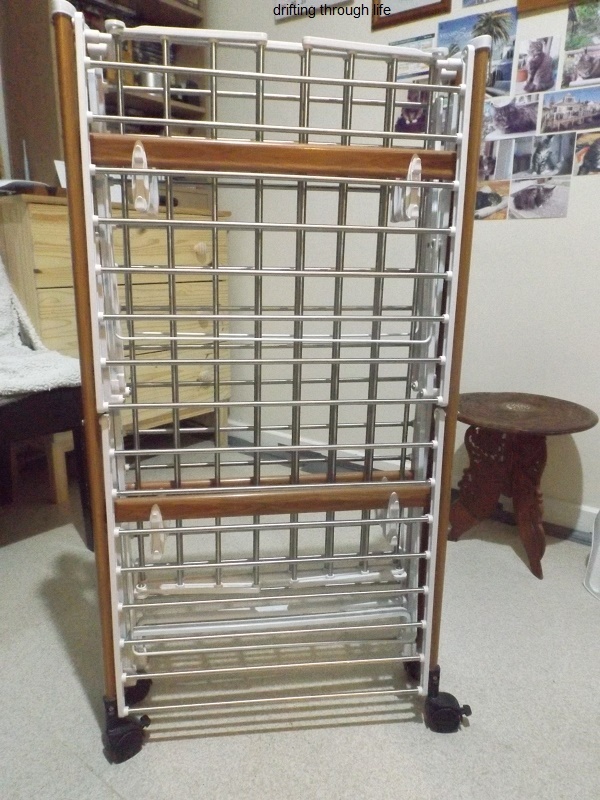 That is a really nice drying rack with all the bells and whistles, as they say. Mine is simpler but it's so handy. I have allergies so I can't hang clothes out, but I dry heavier clothing or things that can't be machine dried partially dry on the rack and finish them in the dryer. 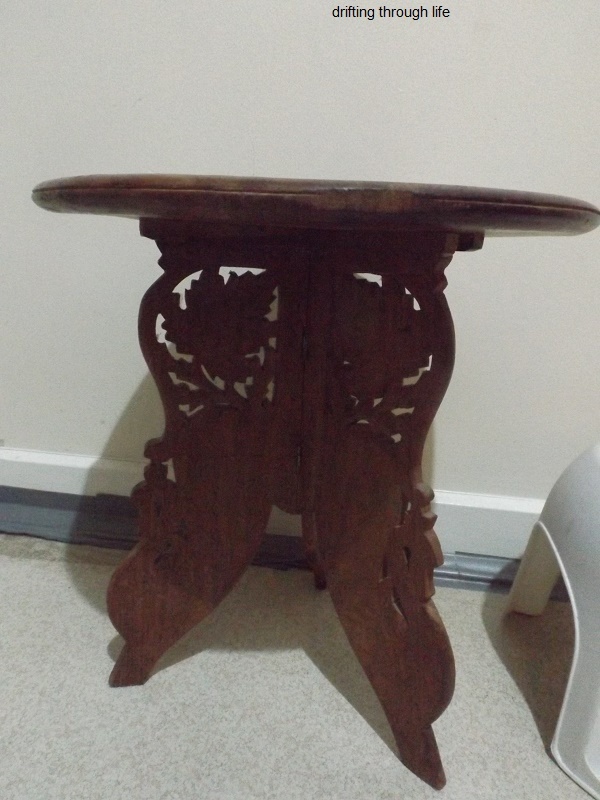 That table is a great find! Our Grumpy used to love to sleep on our clothes airer. It is funny we just saw a picture today of a cat doing that, and I am well behind on my blog reading this week so I only just got here now. Weird coincidences.